During a bright, sunny day at Ultra Fest 2014 concert goers received quite the treat. An elaborate lime green minivan with decals of marijuana leaves and scantily clad women in bikini’s sorting through candy. The weed wagon parked and soon, it was mobbed by young people with intrigue. The man driving the van, who goes by the name Lil Kush, handed out what are perceived as weed lollipops. Chris “Lil Prince” Harty, a man in his 20’s, decided to indulge with a lick or two waiting for the lollipop to, well, “pop.” He told us he’s a little discouraged. The green mini-van is a part of a fleet of two dozen vehicles similarly decorated. The caravan is part of Weed World Candies Inc. They travel the country from New York to Los Angeles to Texas and Miami to sell these weed lollipops. If the candies actually do contain THC, the chemical in marijuana that provides a euphoric high, then a crime is being committed, according to Miami Dade Police Major Delrish Moss. “If the lollipops or the things they’re distributing contain an illegal substance, then yeah, they’re drug dealing,” Major Moss said. It turns out, these lollipops, are not illegal, technically speaking. NBC6 wanted to know more about the Jolly Lollies and caught up with the owner, Dro Man, in Houston, Texas. He was in a Weed World Candies RV traveling from a Austin to New Orleans for JazzFest, where he’ll do more business. As for the “Weed Candies” he hocks? Depending on which state he’s in and it’s medical marijuana laws, not all of his product is loaded with THC. Only 22 states have medical marijuana laws. Dro Man said, “For the other 28 states that don’t have medical marijuana we use hemp.” Hemp won’t offer a euphoric effect. No high. Dro Man says you may not get high, but you’ll get by. 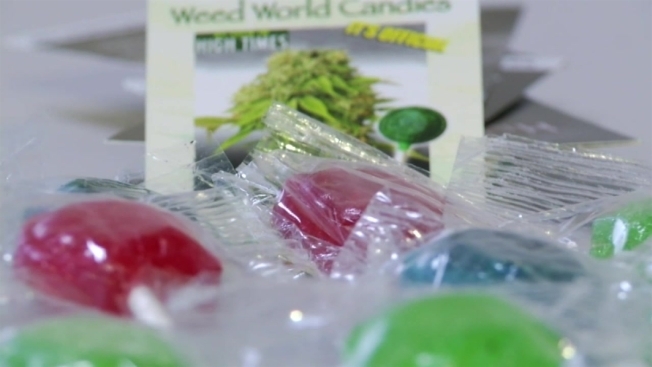 Weed World Candies was registered and incorporated in Alabama in 2007. However, it’s not licensed to do business and according to the Alabama State Revenue Office, hasn’t paid county or state taxes since incorporating. Dro Man said he has two medical marijuana dispensaries which operate under different names. One is in Los Angeles, the other in Denver. He also offers franchising opportunities for a $10,000 buy in. Products consist of lollipops with names like: Lemon Drop Kush, AK-47, Keisha, Purple Urkle. Weedworldcandies.net also sells baked goods. Anything that can be made with butter can be spiked with marijuana oil or hemp oil. The motoring marijuana gang and its contractors stop at major events around the country. Usually mega concerts like Ultra, Coachella, South by Southwest, and the like. And yes, Dro Man says they get harassed and have been arrested. “Actually we’ve been arrested quite a few times over the years, but in recent years, the marijuana laws have changed a lot. So we aren’t harassed or arrested as much,” Dro Man said. One of Weed World contractors who was on Miami Beach in March was arrested. Antonio “Lil Kush” Johnson was arrested, not relative to Weed World, but for rolling a joint in front of the Clevelander. He was charged with possession of a controlled substance. Where there’s people; there’s business. Weed World Candies Inc. and it’s minions will roll on with a business that promises “each lick is like a hit.” Dro Man said business is brisk and says the future is more than promising if and when the entire country becomes more accepting of Whacky Tobaccy.